The How Can It Be Gluten Free Cookbook is more than just your typical gluten-free group of recipes. The HCGF cookbook not only tells you what recipes to use, by why they work. These recipes were tested and perfected in a test kitchen, not merely thrown together or copy and pasted from anonymous sources so you can be sure you are getting recipes that will actually work. In the book, you will be given measurements for two popular name brand gluten-free flours that you can use in the recipes. In addition, there is also a recipe to make your own gluten-free flour blend with weights and measurements for increased accuracy. Baking of any kind is a science and simply putting in gluten-free flour in place of regular doesn’t always have very good results. Having accurate and tested measurements makes baking success far more likely. This book is largely geared towards taking existing foods that we are all used to and designing recipes that will mimic the taste and texture with gluten-free ingredients. It is not intended as a weight loss style book or a healthy eating guide. The comfort food recipes are just that; filling and delicious food that will leave you with a full belly. The only difference? No gluten in your belly when you’re done. With over 400 4 and 5 star reviews on Goodreads and over 800 top ratings on Amazon, The How Can it Be Gluten Free Cookbook has many cooks with gluten sensitivities eating well and enjoying their kitchen again. What makes this volume unique is its commitment to creating scientifically and culinarily sound recipes that do not merely substitute in gluten-free flour for regular in an existing recipe. There is a scientific basis that is explained along with detailed measurements of flours that make this perfect for those who are tired of the guesswork that sometimes goes into creating gluten-free dishes and baked goods. The one issue some users may have a problem with is that because of the need to add protein to gluten-free bread recipes, egg whites and milk protein are added which can be an issue for people who are vegan or who are lactose intolerant. 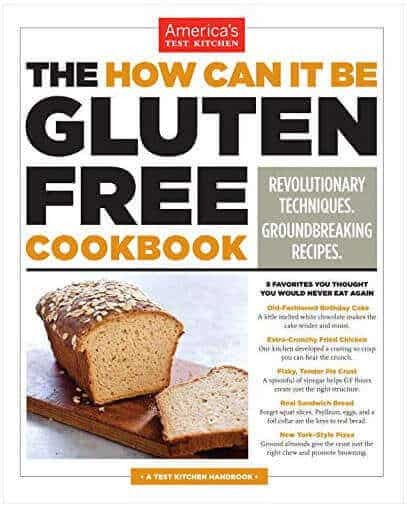 However, for those who mostly just need to avoid gluten, this cookbook may be the best answer since it provides recipes for many classic dishes and comfort foods that celiac sufferers miss out on.